Cut through the digital noise ..... 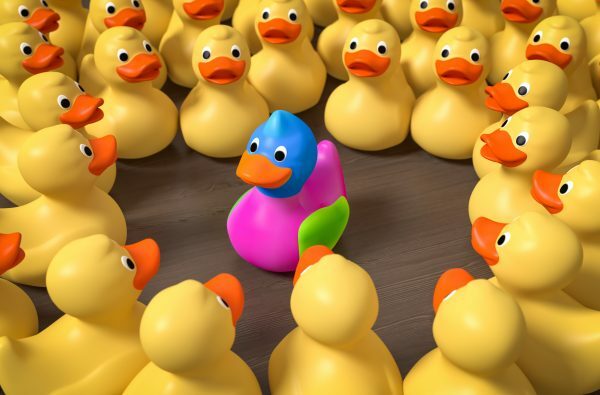 STAND OUT! In a technological world, it’s very easy to underestimate the importance of print. However, good ol’ flyers, leaflets and brochures are still being used in their hundreds of thousands today to advertise a business and why shouldn’t they be? They are an effective way of advertising if you do it right. It has never been so important to really think about your print marketing and how to make the biggest impact. When looking at your print design, ask yourself these questions. If you were the manager of the company you’re targeting, would you pick up this leaflet over others? Does it stand out? If the answer is a probable no, then go back to the drawing board and make sure your print has the M factor. That’s M for memorability! Have you ever recognised someone but can’t remember their name or what they do? Unfortunately, this is true for most of us. Think of your print as the memorable face of your business. In order for it to be remembered, it needs to be consistent throughout. Something as simple as keeping your logo placement, colour scheme or font constant, can help clients to pick your ‘face’ out from others. As much as we hate to admit it, we all take the path of least resistance. For example, if we had a choice between a flyer with heavy text or one with a few bold statements, we would read the one that takes less effort. A clear and concise message that explains the product in a couple of seconds is more likely to be read, so keep it short! Another way to get noticed is for your print to be engaging. If you’re grabbing the attention of someone and maintaining it, then you’re doing a good job. “When brands appeal to more than three senses, advertising effectiveness will increase by 70%” (Martin Lindstrom, writer of Brand sense). People are naturally curious. If you’ve instinctively reached out to touch something that looks soft or smell something that may smell good, then you know exactly what I mean. We all use our senses, not only to explore what we see but to better understand it. Whatever the product is that you are selling, you can use this natural impulse in your marketing! Whatever your service, you can capture attention in your printed materials by using soft touch laminates, UV varnishes or embossing. If your product is smell or taste dependent? Magazines nail that on the head by providing small samples with the advert. Regardless of your product, think outside the box and be creative! You should decide on the shape of your print before your design. If your print is a leaflet, consider the impact of the fold you use. As many use the generic basic fold or roll fold, perhaps explore other options such as the accordion fold or gate fold as a more fun reading experience. Neither option is wrong, but a unique fold can easily catch your eye. In the case of a flyer, you can again experiment with the kind of product you offer. If you offer a painting and decorating service, why print a rectangular flyer when you could design a cut-out one in the shape of a paintbrush? You could also even go a step further and add a splash of spot UV on the paintbrush end to make it look like wet paint! Going beyond basic shapes and using techniques such as die-cutting are simple ways to get your print noticed. 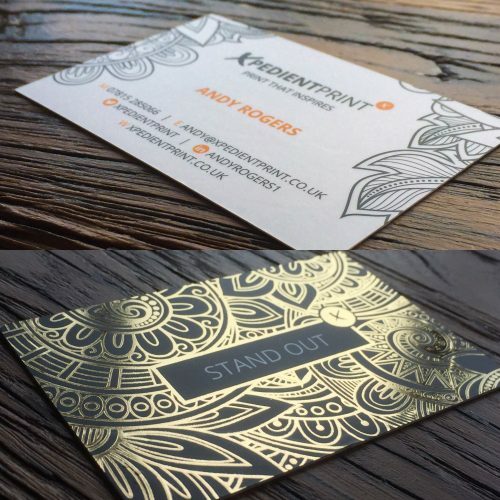 Whether you are choosing card over paper or white font on a black background to get noticed, a quality print finish can be just as important as the information you are providing. 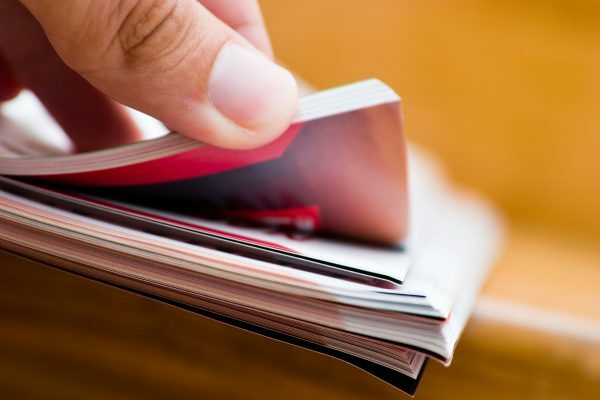 Choosing luxury paper for a brochure, thicker paper for a leaflet, or even soft touch lamination for your business cards are some ways to show the quality of your business and to make a lasting impact. So, when it’s this easy, why not give the best possible impression? Everything you give out should mirror the quality of your business, so really, it’s a no-brainer when it comes to a high standard finish. As print is often the last part of the process, it tends to be the part which gets squeezed on price, but it shouldn’t be. When used effectively, print can help you to enforce your brand, build your credibility and improve your response rate, so it should be viewed as an investment and not a cost. Business begins with that first impression and, by investing a bit extra into your print, you can make sure that it is a lasting one. Because let’s face it, who wouldn’t remember someone who engaged the senses and got them emotionally invested in the process of ink on paper? As specialist printers, we love to help companies get creative and produce print that delivers results. If you want advice or creative inspiration on your print, feel free to give us a call. 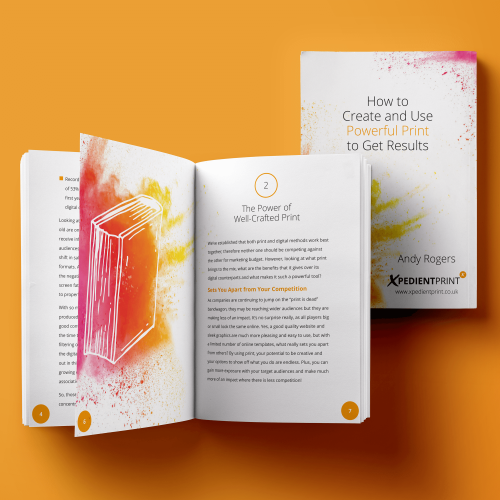 For more advice on making an impact with your print, check out our other articles and download our free PDF guide!